They say Benjamin Netanyahu has been walking around the Prime Minister's Office in the past few days, mumbling to himself and to those around him, "I will beat Obama." There is no point in checking whether this is true or not, because there is not a single official source in Israel who would go out of his mind to such an extent and actually confirm it. Netanyahu can be encouraged by the news from the past weekend: Chuck Schumer, the senior Jew on "the Hill," who had everyone waiting for his announcement, said "yes" to Bibi and a resonating "no" to US President Barack Obama. This is a great victory for Bibi, who fought like a lion against the nuclear agreement with Iran, although some would say – one more victory like this and we are lost. Let's assume for a minute that Obama will be defeated in the vote even after imposing the presidential veto. So what? All the other world powers and countries, including Russia and China and Britain and France and Germany, are already acting as if there are no sanctions against Iran. They are competing over the Iranian coffer and pocket, and to hell with the State of Israel. In such a situation, even if the US removes its signature from the agreement, there will be no sanctions against the Iranians and they will have a nuclear bomb. And in more intimidating words: Dozens of nuclear bombs, which will make the current Middle Eastern equation irrelevant. We should internalize the fact that we have lost this battle against Iran, and that's an understatement. Some will argue: First you said and wrote that it's impossible to defeat an incumbent American president, and now, when you hear the victory bells ringing, you say it's not important. The response to these critics is: Exactly. Every American president after Obama, whether a lover of Zion or a fan of Islam, will bring Bibi's victory story to the White House as a lesson, if he wins. Not a single American president, from any party, likes to be manipulated or schemed against, and the next president and the one after him will be twice as careful of the accusations of the Jewish influence, the money flowing like a stream into the sea and the legendary power of AIPAC – the Jewish lobby which is almost as strong as the gun lobby in Washington. That doesn’t mean, of course, that an American president, whether a Democrat or a Republican, will abandon Israel, but he will remember 24 hours a day who is breathing down his neck. Such a president will try, and let's hope he doesn’t succeed, to reduce the power of the Jews in the United States and perhaps also their great financial power. He is anyway hearing from his experts about the drop in their power. He will take an example from the Jonathan Pollard affair: For 30 years, the Israelis used all the resources they had, invested millions (in dollars and in shekels) and managed to operate the greatest Americans involved, while the changing administrations deceived them with stories about options for the Israeli spy's impending release, when they actually had no intention of releasing him even one minute before the scheduled date. That's how a world power acts. It disregards everyone. The Americans, unlike what many of us may think, are not naïve. They have patience and nerves, and their historical time is not hysterical. They said 48 years ago that they won't recognize the results of the Six-Day War, the settlement in Judea and Samaria and Jerusalem's unification, and settled for that. They are indifferent to the settlement celebrations in Judea and Samaria, and laugh when every speaker raises the number of settlers, assuming Washington is panicking. It's not. When someone here says, "It would be unthinkable to evacuate hundreds of thousands like this…", they chuckle among themselves. They have already seen the movement of millions and have killed masses on their way to achieve their goals. This is America. This is how a world power acts, and anyone who wants to will be able to ask Pollard about it in a short while. He likely has an opinion about it, despite the commotion caused by the State of Israel in his insignificant case. 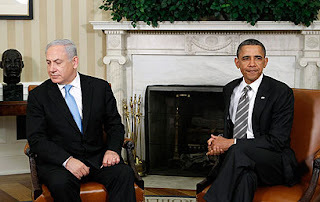 Does this mean that Bibi should cede to Obama now? It's too late. The battle between these two men with an inflated ego is in its midst, and nothing can be done about it. None of them will give up winning. The problem is not which one of them will win this war. Obama will go back to his home in Chicago in about a year and a half, and Bibi will retire from the premiership one day. It's us, the Israelis, who will likely be left with Iranian atom bombs and an America which (possibly) won't forget and won't forgive.